For the perfect balance of comfort and protection, choose Tranquility™ white nitrile. 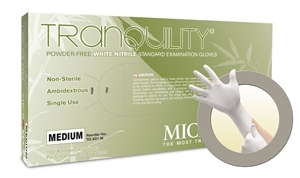 Tranquility gloves are latex-free and contain no natural rubber proteins. The glove of choice for individuals that require a soft, thin, comfortable glove for everyday use. Tranquility™ gloves conform to the hand allowing for excellent tactile sensitivity and grip. Tranquility’s compact box size saves on storage requirements. Tranquility® gloves conform to the hand allowing for excellent tactile sensitivity and grip. Tranquility’s compact box size saves on storage requirements.